VMware introduced Virtual SAN: the first VMware entry into the “software-defined storage” product category. Virtual SAN is optimized for VMware vSphere environments and is doing for storage what VMware vSphere did for compute. VMware Virtual SAN is a new approach to storage. Virtual SAN applies the principles of the VMware software-defined data center to storage to create a high-performance, cost-effective alternative for virtualized environments. What is so special about it? Here are seven reasons why Virtual SAN is a truly unique storage solution that enterprises should incorporate into their storage strategy. Virtual SAN is a 100 percent software solution that is the x86 server instantiation of the VMware software-defined storage vision. Architecturally, Virtual SAN is embedded into the ESXi kernel to deliver unmatched performance by minimizing the data I/O path. The Virtual SAN hypervisor-converged architecture allows storage and compute to run in the same physical host with minimal overhead and easy management through the vSphere Web Client. Virtual SAN runs on any server currently supported by vSphere and a wide variety of other hardware components, which gives customers the flexibility to build a storage solution that meets their specific needs. Virtual SAN leverages a policy-based management framework to enable storage provisioning and management on a per-VM basis.The policy-based management framework enables the VM to define the right amount of capacity, performance and availability it needs. The Virtual SAN software takes care of the rest by matching requirements with underlying storage resources. Policies are then monitored and maintained through SLAs, with the Virtual SAN system self-monitoring to maintain service levels. This policy-based framework can simplify storage provisioning and management and automates routine storage tasks to increase efficiency. 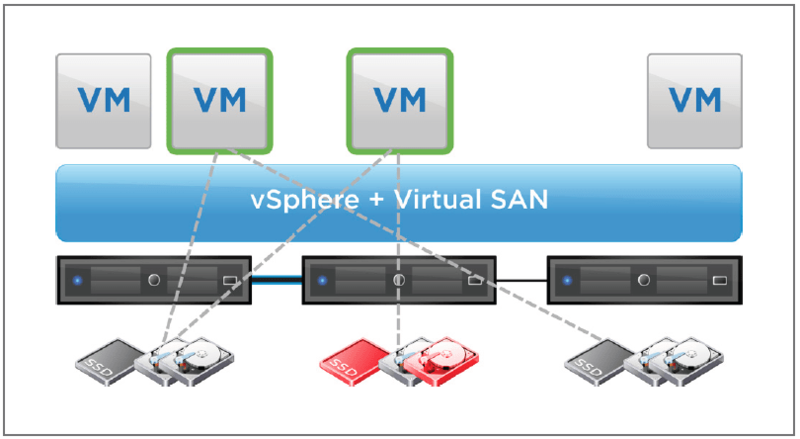 All Virtual SAN setup and management happen using the vSphere Web Client. Deploying Virtual SAN takes a few clicks and uses the same user interface that is used for vSphere and compute. Unlike other storage products that introduce new management tools or loosely integrate into vCenter, Virtual SAN was designed into the vSphere product, making it easy to monitor and manage. Virtual SAN can accelerate performance by pooling serverside HDD and SSD storage resources to create a read/write caching tier. This cache tier operates like a write buffer and read cache to speed write-intensive workloads and improve system I/O performance. Virtual SAN can deliver a highly resilient shared storage tier optimized for virtual environments. Through policies, Virtual SAN enables users to replicate data to tolerate simultaneous failures leveraging a distributed RAID architecture. By leveraging vSphere HA, Virtual SAN can identify and remediate failures without interrupting service levels. Virtual SAN is interoperable and works with the VMware stack to deliver convenience and ease of use. Virtual SAN is designed to work seamlessly with other VMware products to make it easy to integrate into the data center and use across multiple use cases.